The Marjory Stoneman Douglas Public Safety Commission met on Wednesday for the first of its two September meetings. 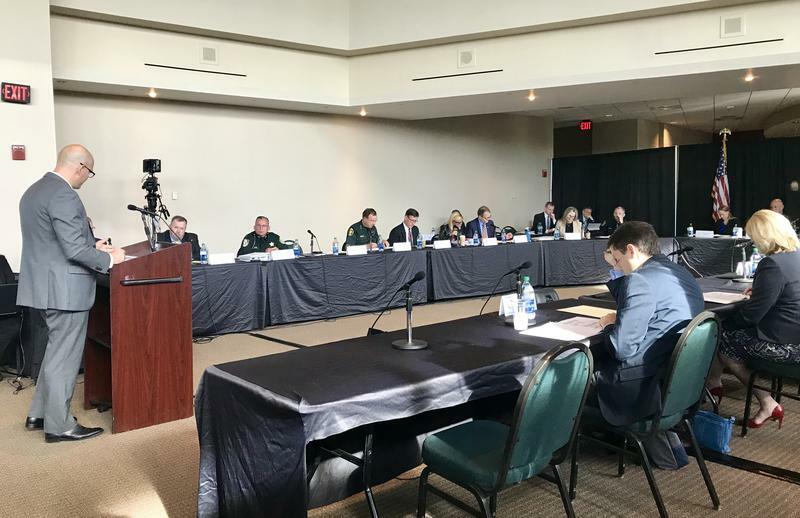 The state commission that’s investigating the Parkland school shooting discussed on Wednesday ways to improve school safety, agreeing that middle and high school campuses should always have at least one police officer present. Elementary schools, however, could have an armed guardian instead of an officer or sheriff’s deputy, the panel decided. 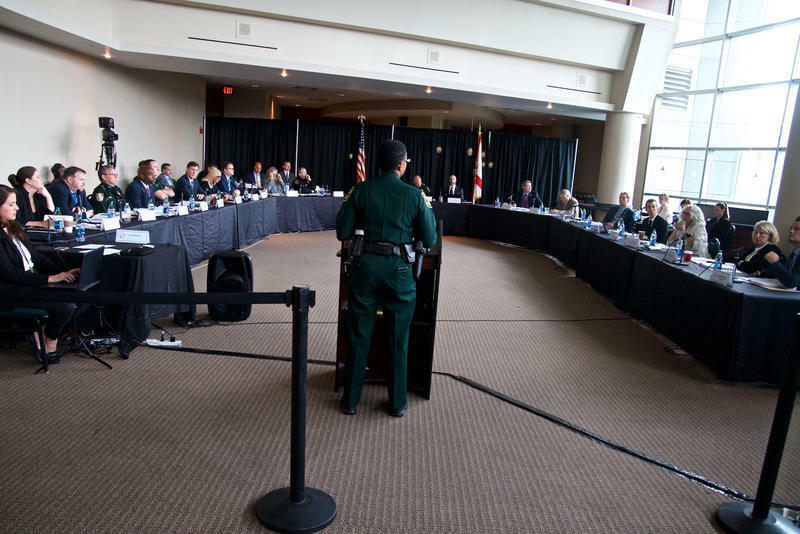 The Marjory Stoneman Douglas Public Safety Commission, which meets at the BB&T Center in Sunrise, is beginning to draft recommendations as part of its report that will serve as a statewide guide to advance school security. The decision on law enforcement at schools came after much debate about how officers should be assigned to school campuses. Pinellas County sheriff Bob Gualtieri said including police officers or sheriff deputies at all elementary schools is not feasible. The state cannot afford to place a police officer at each of its 3,900 schools, he said. “Every agency is down and every agency has hiring challenges," he said. But former Brevard County schools superintendent Desmond Blackburn disagreed that elementary schools should be left out of having a minimum of law enforcement officers. Elementary students are the most defenseless, and armed guardians may not be as skilled as police officers, he said. He voted for an unsuccessful recommendation that would have also put a police officer at every elementary school in the state. “We have ports, we have nuclear facilities, we have courthouses, we have the [Miami] Dolphins next football game that are all more heavily protected with official police officers than our schools,” Blackburn said. Shootings have indeed occurred at elementary schools across the country—most notably the massacre at Sandy Hook Elementary which left 26 people, including 20 first graders, dead. Still, Polk County Sheriff Grady Judd said cities do not even have enough officers to place at every school. Doing so could involve pulling officers away from other assignments, which could compromise law enforcement operations, like responding to traffic incidents, Judd said. “We can like it. We can not like it. We have to realistically approach this,” Gualtieri said. In addition to the discussion on police officers at schools, the commission reviewed surveillance video showing the response of former Broward Sheriff’s deputy Scot Peterson who was on duty at Marjory Stoneman Douglas during the shooting. Peterson resigned after videos showed he did not enter the 1200 building during the shooting, and will testify before the commission in October. Commission members also discussed on Wednesday fusion centers, which are state and local information sharing agencies created after 9/11. The centers help law enforcement share data with each other about safety and criminal activity. Jessica Davenport, the senior management analyst supervisor with the Florida Fusion Center, told commissioners the data sharing is beneficial. After the Parkland shooting, fusion centers worked together to prevent potential follow up school attacks, she said. Fusion centers are now collecting information using the Florida Fortified App, which allows people to report threats against schools. Still, Ryan Petty, whose daughter Alaina died in the shooting, said the model appears to be more reactive than proactive. “It seems that the steps we have taken are nothing more than a thin veneer of communication and collaboration,” Petty said. The state commission investigating the Parkland school shooting has conducted 300 witness interviews so far. But there's at least one more high profile witness to go: former Marjory Stoneman Douglas High School resource officer Scot Peterson. Peterson was the Broward Sheriff's Deputy on duty during the shooting on Feb. 14. He resigned shortly following the shooting, after surveillance video revealed that he did not enter the 1200 building to engage the shooter during the massacre.